dbTwang V3 - what is in the technology melting pot? The Guardian service subscriptions are managed via Spreedly which then goes through to Realex Payments and Elavon for our merchant account. Our Affiliate program is run via Affiliapp integration with Spreedly. The blog runs on a hosted version of Wordpress and there are a number of plugins there with which I am not familiar. Thanks to John Keyes for his assist with this. The email newsletter is done using Mailchimp. Any questions on any of the above please ask, it is an illustration of just what you can outsource these days - and also the interdependency when delivering an online service. Vodafone 360, could be stickier than an unlocked iPhone. Beware! This is one number which is getting worked heavily this year - U2's tour is the 360 and now Vodafone using it to name their upcoming new service (shame they are not Blackberry 'cause then there would have been synergy). I was invited (along with a bunch of other bloggers and journo's) to the launch on Thursday. To be honest this was a kinda day off for me - the previous weekend was shrunk by bizcamp and I have one day off over the 2 weekends coming up. So I happily went to Dublin, met up with John Keyes for coffee and then we strolled along Stephens Green to the poshiness that is Bentleys. Vodafone 360 is a combined service with 3D view which will be deployed across most/all phones. Have a look at the video from Channelship which they shot at the event. Not available yet - a month or two away. The Peoples Republic of Cork are featuring heavily here - Pat Phelan has been building out his empire in Cork for a couple of years now and last night put in some heavy duty hours with his team (bedtime was 03.45am) to put in an upgrade to Maxroam.com. Ruby On Rails Hosting - suggestions? When dbTwang.com launches it will be aimed at the UK and US mostly with users coming in from other countries as well. Numbers not likely to be too big in first 6 months. for consideration. Who would you suggest dear reader? All thoughts, contributions welcome. Minister said ICT facilitaing collaboration and pulling on our story telling heritage is the key to our economic future. Reference to multilateral engagement of this process. Reference to Japan and ubiquity, available to everyone, across all locations and devices. Open access networks. Speeds are important, we should provide ahead of demand. Applications important, they are the reason for this speed and will drive demand. Sitting through a timeline of audio from pirate radio to podcasting in 2008. Giving me a great context of the developments in this space and how things which I take for granted now evolved. Want to order an iPhone online but you are a customer of theirs? O2 banned existing customers from nibbling at the iPhones available online (from their forum: Please note also, for existing O2 billpay Customers wishing to upgrade to iPhone 3G, this can only be done via an O2 Store or a Carphone Warehouse store ). 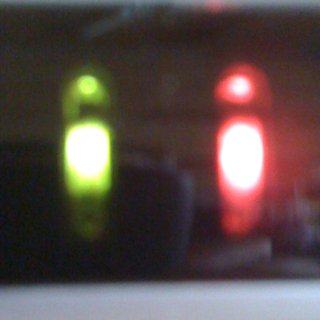 The glowing red light on my modem shows a dud Internet connection. So I am on the O2 dongle and the iPhone for a couple of days - Eircom have a 3 working day turnaround for broadband repairs. Which for a business service into a SOHO leaves a lot to be desired. My BT service, ordered on 25th August, is nowhere to be seen. Just as well I am travelling for a day or two! Last month I wrote a brief post on iGoPeople, a new startup coming out of Dublin. Yesterday I had an opportunity to spend some time with Campbell Scott who is their CEO and he filled me in on their product and focus. Campbell came over from the dark side (he was in Corporate life for 26 years - he worked with Eircom and O2 most recently) and he has adopted nicely to the nimble and all embracing world of the early stage technology startup CEO. Useful to know up front that their initial focus is small and medium businesses as well as organisations - larger businesses are further down the road for them. This indicates a pragmatic approach for me - sales cycles into bigger businesses can be long and for the service they are developing it is likely that a large business will already have some elements of it in place. They offer a place where the noise, issues, talk, commentary and discussion about brands, products, and businesses can be gathered so that a visitor to the site can get both the company pitch and also the feedback and thoughts of customers and consumers. This appears to be a simple proposition - and it is. The price point for a small business to have a presence here is currently under e300 and for that you get a managed solution to allow your interaction with customers/clients to be harnessed and structured. Yes you could blog, you could set up a website and you could have a forum - however there are many, many businesses who still struggle with setting up a basic site never mind functionality of any kind. They are also proposing to target organisations - possibly establishing a directory of same for Ireland. The same functionality would be appropriate here. I quickly understood it and liked it. On the technical side they have a strong team of inhouse techies and (similarly to dbTwang) they are using Ruby On Rails and working through rapid iterations of the software backend and the user interface. I like browser based tools and use one called Sitekreator.com for the building your own website training which I deliver. The object of desire in this weeks Tuesday Push (I am late with this, my Tuesday and Wednesday were taken up with consultancy and dbTwang meetings and work) is such a tool - ewritelite from a business based in Cork. Gordon and Co have developed a simple system for managing content for small to medium businesses. Up front I have got to say I do not like the initial look and feel of the site - it does not feel like a service which I would ask a client to commit to. Whining aside the service seems solid and Damien gave it a good review here. The price point is a little bit high for my liking - e200 per annum seems just too much for a small business to commit to. But I am not the target market and I am sure they have a handle on the marketing and pricing. They do other products as well - an email newsletter service and one for form building and management. I hope they continue to expand and develop - there is a market for easy to use services at the lower end of the market. I posted last week about a stealth startup service from Mapflow, it is open to view now and has 56 users. Good luck to everyone concerned. May as well start with a relevant headline. The man and business whose recent mission in life is to bug mobile operators globally (and make frequent travelers happy to boot) has launched V2 of Maxroam on the anniversary of the initial appearance. 100,000 customers will now see significantly reduced data roaming charges - a bonus on top of their savings on voice traffic. Loads more in his post here. While Pat mingles at the Techcrunch50 gig the Irish Mapflow team (veterans from the dotcom days) are due to launch something on the eirlift.com domain at DEMO. Rosie Broderick is the founder of homewise.ie - an aggregation site for home and garden products and services in Ireland. They also carry supplier reviews and have built in Google Maps so it could be a really useful resource. Conversion of visitors into paying customers. Should be a great session - and it is FREE :-). Contact Kilkenny CEB at 056 7752662 or info AT kceb.ie for more. So when will someone invent self service over the internet? I registered for a video tag with eflow and received a letter with my account number and activation code. Which I had to ring someone with!!! No option to go to their site and enter it myself. To rub salt into the wound their systems were down when I called so all of those activation calls are being noted and someone is going to have to enter them when it is back up again and give each of us a call to let us know it has been done. Finally made a decision on this - spoke to Fintan (dbTwang co-founder) who has a large client in Kilkenny who uses BT for broadband and he is happy with them - says their business support is much better than their domestic. So placed the order today and should have it within 2 weeks. With any luck it will be stable and I will have 24Mb (in reality about 19mb according to the boards.ie discussions) for the price of what is currently 3mb from Eircom. Do I need this - not particularly at present. Do I have anything in mind for it? No. But it will be interesting to see how my use and consumption of the internet changes. Power out for 3rd time in a week! This is kinda annoying - for the third time in less than a week the electricity supply is gone here. Back to my paper reading stash. Just had text from them saying limited stocks in store tomorrow. Electricity is up there - especially when you are working from home. A 6 hour outage on Wednesday followed by an 11 hour outage yesterday (separate 3rd party slicing cable incidents) have left me catching up on paper reading (including a legal document containing this paragraph of gumph, my emphasis!) but behind on other work. 1.4 Any reference to a Clause, sub-Clause, paragraph, subparagraph or schedule shall be a reference to a Clause, sub-Clause, paragraph, subparagraph or schedule (as the case may be) of this Agreement and any reference in a Clause to a sub-Clause, paragraph, or subparagraph shall be a reference to a sub-Clause, paragraph or subparagraph of the Clause, sub-Clause or paragraph in which the reference is contained unless it appears from the context that a reference to some other provision is intended. My clients are mostly "normal" businesses so they are not interested/able/bothered about learning or using complex solutions to anything. Toddle.com fits the bill for those of them who want to send email newsletters. Alan and the team at Toddle are the Tuesday push this time around (I am a day late :-)). It offers design templates for your email (if you think that well designed email newsletters are simple just try it! ), pricing is per use (e6 per newsletter) and that is for unlimited numbers. I have not used this one but would happily do so if I needed a simple solution for a good looking ezine. 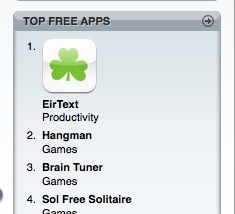 My first application download for the iPhone was Eirtext - an app that allows you easy access to those bundles of free texts which you can send from your browser each month. UPDATE - at the same time that the site was down for essential maintenance so were all of their retail and IT systems - see this post from Alexia. We are currently undergoing essential maintenance. As part of this maintenance o2.ie will be unavailable. For urgent queries during this time please contact Customer Care on 1909 (Pay monthly), 1747 (Speak easy) or your account manager. UPDATE 7/08/08. A call to customer service this morning revealed that the system shows a duplicate order. Customer care are going to ring me back. And Maria (o2 guru) on their forums is looking into it as well. An order placed yesterday morning (05 August 09:17:42 ) currently has a status of Pending - Your order has been received. You will receive an email to confirm when your order has has been accepted. This is when you start to notice the minor details such as Your order will arrive within 3 working days from the time it is accepted. So 2 working days after my order was placed it is still not accepted? Maybe it is the credit check referred to on page one of the order (I have been an O2 customer for years spending a substantial sum of money each month and paying by DD) or it could be the transfer of my service from another mobile operator as referred to on Page two of the order (see above). Maybe there was a flood of orders and the sheer volume has overwhelmed them? Maybe their admin systems were not in place? Maybe they are an incompetent multinational making too much money to both with being efficient? I wonder what their customer service will say? Seems to me like a made-up headline. Except that it is true. Gets you to the local area plans for Callan and Castlecomer where you are invited to join in discussions on the various aspects of each plan. I wonder how popular this will be? Wiki's were challenging even for the techie audience that barcamps are aimed at. Great to see Kilkenny Council experimenting with this. I wonder can this go wrong - I have just placed a confirmed order for the iPhone on the O2 online store. 3 day delivery according to this. So what happens to my existing contract? That will be interesting. As covered in a previous post this went smoothly enough - however noticed a couple of days ago that a couple of the mail folders had not transferred across in the import. A quick look around the Apple forums uncovered the Eudora Mailbox Cleaner from Andreas Amann. This freeware utility also works for Thunderbird and took a couple of seconds to process the offending folders and bring the emails in. Sent out a press release today and used a shared page on backpackit (service from 37signals) to store backup materials - images etc. However a call from a journalist prompted me to go look at their FAQ for this service - where it casually mentions that a shared page refers to the text - but files on the shared pages are not shared. So how the **** is a user supposed to know that? Shared is actually partially shared. Like Typepad password protected was only kinda sort-of protected. Mention this on the sharing page guys - that is where it belongs. This is not intuitive. b) do exactly what it says. With no conditionality or small print exclusions that completely contradict intuitive use. I have set up a link to download the relevant file from elsewhere. But it is sloppy to send that out and have a journalist working on a Sunday not find things they need. The (relatively) quiet period I am having right now is giving me time to explore my work organisation and rhythms and look at the tools that I use day to day. 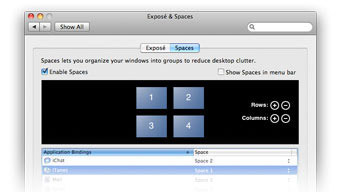 I just took the time to look up Spaces - one of the many bits of functionality on the Mac which I had ignored up to now. it is really useful - I have assigned my email, RSS and VOIP/IM applications to the first Space so that they are out of the way of my work as I do research or write documents in one of the other Spaces. They remain very accessible - but not on the desktop and that appears to make a difference.